Stylish & chic aren’t usually words you apply to laptop bags. They’re usually chunky, ugly, and not something a Southern Belle or a city chick would be caught dead carrying. Even the usual “ladies” bags aren’t anything to write home about. It’s just impossible to find a great laptop bag that would work for a stylish modern woman that doesn’t cost a fortune, right? Wrong! Finally, there is a designer who knows exactly what to put in a laptop bag for the chic modern woman. You may remember the SOAP network’s show Southern Belles: Louisville that premiered a few years ago. The show followed five women from Louisville through love, heartbreak, and new ventures. Now one of the show’s stars, Emily Gimmel, has taken her career to a new place with the development of a chic and affordable line of ladies’ business totes with the label GRACESHIP. With three great bags already available and one (maybe more!) on the way, Emily is well on the way to becoming the next name in women’s accessories. I waited patiently for my bag to arrive once I placed my order. Finally, it was here! I opened the huge cardboard box, and inside was a gorgeous black laptop bag that would make New York women and Southern Belles alike swoon. woman’s accessory closet. Big, but not too large, the bag will fit a laptop or tablet up to 15.4″ leaving plenty of room for necessities such as your wallet, documents, iPad if you are using the center for a laptop, and planners. Both interior sides of the bag have zippered pockets and one side boasts two pen holders, a phone holder, business card holders, and a key clip to make sure you don’t lose your ride. The center laptop/tablet area is padded on both sides with a magnetic strap to hold in the precious cargo. It is very secure and even when I carried the bag open and not zipped, nothing even attempted to fall out. The bag can be carried a variety of ways due to its smart design of having two long handles to use carrying it by hand or on the shoulder as well as a long removable shoulder strap if you want to carry it that way. I have used both and find that if I am also carrying a purse, the long strap works best, but if I am just carrying the bag, the two shorter straps work great. The bag is just big enough for me to carry my important documents with me in addition to my planner, laptop, charger, iPad, iPhone, and several other things. I’ve gotten lots of compliments on it since I’ve carried it, and I can’t wait to take it to meetings or lunches with friends, clients, or anyone! Since the color of the bag is my favorite (black! ), it goes with every outfit, which is key for any fashionista. 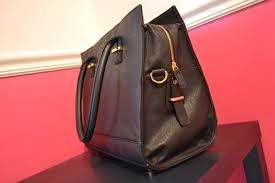 There isn’t anything that I dislike about the bag, and now, I just have to keep myself from buying all of the styles! 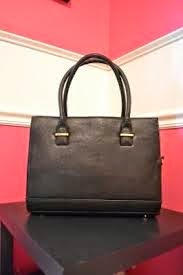 Chic, stylish, & affordable, GRACESHIP’s bags are something every woman should add to her collection! For more information about the bags or to purchase, visit GRACESHIP’s site. Next Post What’s in my Personal Regency?